Henna tattoos generally last anywhere from two to three weeks. The use of henna leaves to create temporary tattoos has been practiced for centuries in Indian, Middle Eastern and African cultures. Mehndi, which is the art of painting the body with henna, is widely used today throughout the world for religious, spiritual and decorative purposes. After the henna paste is applied to the skin, the heat of the body darkens the stain from a yellow into a dark brown color. There are several ways to darken the henna tattoo even more to create a more striking design. Apply the henna to clean skin. Before using any type of henna paste, wash the skin to remove any sunscreen, lotions or perfume. The henna will stain darker and last longer on fresh, clean skin. Apply the henna to areas of the body that have thicker skin, such as the feet, hands and thighs. The henna will appear darker on these areas. Wrap the henna tattoos with toilet paper or paper towel. The toweling is then covered with a layer of cling wrap. The coverings will trap the skin’s heat, causing the henna to become darker. Expose the tattooed areas to a heat source, such as steam, or warm the skin with a hair dryer. This is performed either when the henna paste is still on the skin or after it has been removed. 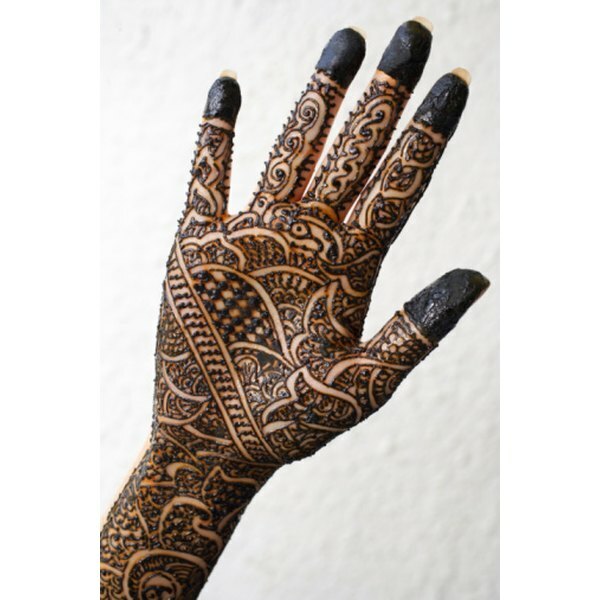 The heat will react with the henna, resulting in a darker color.